Spain coach Vicente del Bosque praised World Cup final opponents Holland after seeing his side lift football's most illustrious trophy for the first time. Andres Iniesta's extra-time goal proved enough to give the Spanish a 1-0 win over a robust Dutch side in a contest which saw 14 yellow cards handed out by referee Howard Webb. 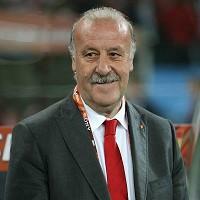 But Del Bosque was quick to hail Bert van Marwijk's side, and said: "First of all I should congratulate our opponents. They made it very difficult for us to play comfortably. It's been a very intense match, and congratulations to them."